If you recently got married, there are so many exciting things ahead for you. But don’t forget to tackle some of the boring things, too. In fact, there are multiple things to do after getting married. It can be incredibly important to have your affairs in order before filing a tax return to ensure that it is processed accurately, and you get any refund you deserve. 1 – Apply for a new Social Security card if you are changing your name. While that marriage certificate feels official, your government records will not automatically change to reflect any name change. You need to complete Form SS-5 with the Social Security Administration. If you just recently got married, or have not been able to get your name officially changed, you should file your tax return using your previous name, so it will match all the IRS records. You must still use a married filing status, even if you have not formally changed your name. 2 – Update your bank account information. The IRS does not allow depositing of a tax refund into a bank account not in the taxpayer’s name. So if your bank account is under Jane Doe but your married name is now officially Jane Smith, you won’t be able to select that account for direct deposit. Make sure your bank account information matches what you have on file with the Social Security Administration and what you use on your tax return. 3 – Update your W-4 and personal information at work. Similarly, make sure your employer has your new name and any new personal information, like your address. You definitely need to look at your W-4 and potentially change your withholding allowances. Your tax situation may look different now that you are married, so you want to make sure the right amount of taxes are withheld from each paycheck. 4 – Choose a married filing status. 5 – Choose the right tax form. With your combined income, and potentially more credits and deductions, you may need to change which variety of Form 1040 you file. You may also consider itemizing instead of claiming the standard deduction, especially if you are now married and owning a home. It might be a good idea to consult with a tax professional to help guide you through these changes. 6 – Look at your health insurance coverage. Do you have health insurance through a federal Marketplace? If so, you need to notify them that you are now married. You may also consider joining a spouse’s health insurance plan. Whatever you decide to do, you need to take action quickly. Hopefully this post offered tips for your after marriage to-do list! 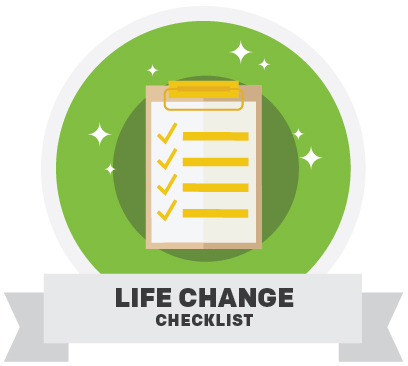 Now that you’ve taken all the necessary steps to file your first return as a married couple, you might want to see some of the additional ways your taxes can be affected by this life change.